Members of the GEM Participants' Council recently visited the Houses of Parliament, allowing them to learn how British Parliament works and help them build their skill set and knowledge as a council member. Sophia Taylor, the Participants' Council Chair shares her story about their trip. "I found the visit insightful and thoroughly enjoyable. 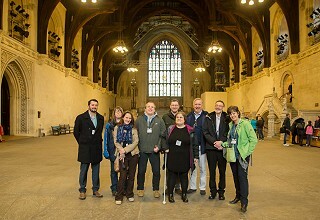 As a group, I felt we were looked after by involved officials throughout including our parliament tour guide member, the MP's personal assistant and the MP himself Alex Chalk (Cheltenham Borough). Alex and his assistant participated with our afternoon tea and he welcomed questions and concerns from the group. He seemed sympathetic, thoughtful and provided some great advice to us on engaging with people to obtain views. The tour itself was both educational and exciting, as it covered British Royal History and modern political procedures which form our lives as we know it today. Personally, I have had little knowledge and interest with history and politics of Britain, however my perspective and understanding has changed and widened thanks to the visit. It provided such great information that not only I can use as a GEM representative, but also on a broader scale. Additionally, the House of Commons was part of the tour which was really interesting, especially compared with media and television coverage. We saw MPs passionately debating major issues and expressing concern from their constituencies. Somehow, being at the House of Commons in person and seeing live debates made the whole experience more real and mind opening." If you would like more information about the Participants' Council or would be interested in joining, please feel free to come along to an induction session. The next one is being held on Thursday 31st May from 10.30am until 12pm at GRCC Offices, Community House, 15 College Green, Gloucester, GL1 2LZ. The GEM Project is recruiting! The GEM Project is looking to recruit two Navigator Developers to support individuals on the GEM Project. Have you ever thought about helping individuals move closer towards or into employment? The GEM Project is committed to helping people in Gloucestershire who may be finding it difficult to enter or re-enter the world of work and is looking to recruit two Navigator Developer's to continue offering this support. These positions are available through our partners; The Cheltenham Trust and FRP. Our GEM Navigator Developers work directly with individuals signed up to the GEM Project, providing 1:1 support to guide each person throughout their entire journey to help them reach their work related goals.